Tarot Stories: Call for Prompts! 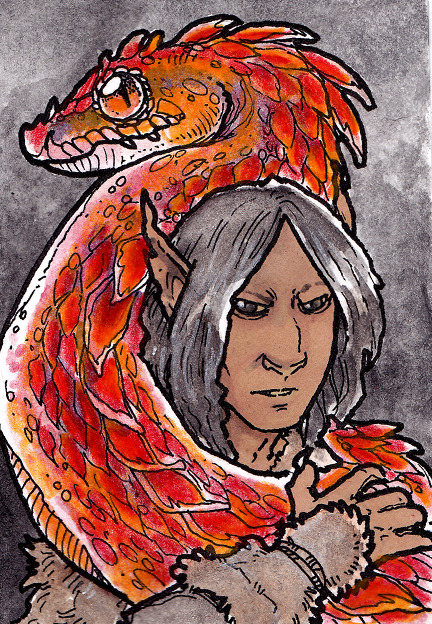 Over the weekend, I finished the last of the prompts from my first call for tarot story prompts. That means I get to do a new call for prompts! Yay! 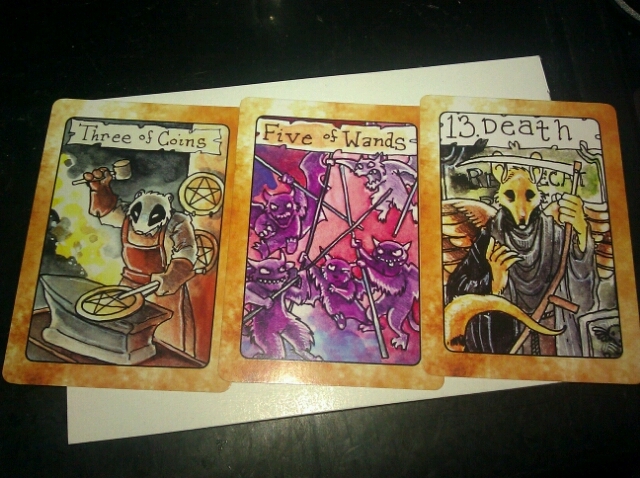 I bought a new tarot deck from djinni: Tod's Creatures Tarot. This deck is illustrated with adorable cartoon animals, and very different from the Silicon Dawn deck. For one thing, having most of the figures be cartoon animals makes many of the cards feel gender-neutral, which is neat. I'll be drawing from this deck for this round of prompts. I am curious to see what effect it'll have on the stories! * Provide a question/question/situation. This can be the same kind of question you'd ask in tarot reading, or it can be any random concept that interests you. * Character(s). You may supply your own original characters (or ask for particular ones of mine). No fanfic unless one of us holds the copyright, please..
* 1-3 cards. If you want to pick one or more specific cards, you may. I will be using the versions of the cards from Tod's Creatures Tarot regardless, though, because I like being able to hold the physical cards. I'll draw three cards at random if you don't have a preference. For most of his life, Kerrington had had the same nightmare every night. It had started when he was a child, and even when he had it as a grown man, he'd still be a child in the nightmare. It always started with him hiding. In the shadows of an alley, under a thick cloak that made him look hunchbacked. But a hunchback was a harmless cripple, not a monster with wings and horns. So he crouched in the lee of a building, hood pulled up and the cloak lumpy around the horns that sprouted from his neck and shoulders. From there, he'd watch all the normal people. Little girls holding their mother's hands, begging for a sweet bun from the baker. For a smile and a "pretty please, ma'am", they'd always be rewarded with one. Boys watching their fathers ply their trade, learning to carve furniture or hawk cloth or set wagon wheels. Playing in groups in the streets, chase-the-ball or catch-the-runner or find-the-hidden. That part wasn't so bad. If he watched really hard, he could pretend he was one of them. That he wasn't just watching someone else's life, but living it. He'd always thought that as a child, that the problem wasn't in his body but his mind, that he just needed to try harder. That if he smiled just right, and said "pretty please, ma'am", normal people would like him the same as the ordinary children. There was a code in the way they acted, he'd thought. A code he was missing, but he was sure he could learn it, if he just paid close enough attention. So he'd watch in the nightmare, until it all clicked and he knew just what he needed to do to be accepted. Then he'd skip out into the light of the street, putting his hood back so it bunched over his horned shoulders as if he were hunched. He'd smile at the baker, and ask sweetly for the smallest taste of a bun. The baker would smile back and say "Oh, I oughtn't ... " and Kerrington would widen his eyes and tilt his head and give the most innocent pleading look. "... oh, you scamp, here you go." She'd give him a whole bun, and he'd thank her prettily, his heart bursting with gratitude. That was the worst part, because then she'd say, "Such a good -- " as she reached out to pat his shoulder. Then her expression would turn puzzled at the hard point of a horn under her fingers. The cloak would tear over one point, then over all of them. The baker would put her hands over her mouth, screaming. "Monster!" Everyone, up and down the street, would be staring at him, terrified, horrified, furious, as the cloak turned to tattered shreds about him. He'd lift his wings to fly away, but the remains of the cloak would tangle them. "No, no," he'd say, tears running down his cheeks, the untasted bun clutched to his chest. "I'm not a monster. I'm not!" Children would pelt him with stones, yelling, "Freak! Monster! Animal!" Townsmen and guards would cluster around him with drawn swords, hacking at his wings and his horns, screaming imprecations. The horns would break off beneath the swords, the wings came apart in clusters of feathers, each blow leaving him writhing in white-hot agony. But although they came off, they did not stay gone: as fast as the normal people could hack away at his deformities, they would grow back like hydras, two more springing up in their place. Until he was choking on feathers and covered in horn, smothering under the weight of his grotesque body. Until he'd awaken, face buried against the ground or a blanket or dried leaves, body covered in sweat and sticky molted down. That part of the nightmare was always worse than the reality.Kerrington had lost count of the stonings, beatings, mutilations and attempted executions he'd endured. In the real ones, he usually lost consciousness faster than in the nightmare, and when he came back to life, with regrown horns and wings and limbs, he was just the same as before, not worse. Once, he'd thought the nightmares would stop after he gave up. Stopped trying to be like normal people. Stopped trying to fit in with them, to live with them, to watch them or understand them. He walked away from the people who would not, could not, ever accept him. He turned to the path of dark magic, consoled himself with monstrosities conjured from the fruits of stone circles. He was a monster, after all. He belonged with his own kind, and if those other monstrosities craved the blood and deaths of ordinary men -- well, why should he care more for their lives than they cared for his? But even on the dark path, the nightmares did not stop. Every night, he still tried to belong, and every night he still failed. Nothing changed. Until that drunken fool of a village boy stumbled into that stone circled and tried to save him. Him! "You're a good man, Kerrington," Eric said, and when he patted one of those horned shoulders and cut his hand, he ... apologized. Not screamed, or fled, or fainted. Apologized. Like it was Eric's fault. One moment should not be enough to change a lifetime of fear and revulsion. But Kerrington never had that nightmare again. For that alone, he owed the fool something. I'm not a good man, Eric. It's three years too late for that, if indeed there was ever a time that it wasn't too late. But I think I finally know what a good man looks like, and by the eight Hells, I'll not let any harm come to you. For three seasons, the Dark One had left Eric's province untouched, safe, for the memory of that one moment. But as his forces grew, in number and power and appetite, Kerrington wondered if he'd always be able to constrain them. And what if Eric left? What if he wasn't a local to that province at all? So he'd given his minions the young man's scent from a stained handkerchief, and sent them to track him down and bring him back. "Did the Dark One get you too, Kerrington?" I suppose he did, after a fashion. From the top of the Dark One's tower, Kerrington watched the storm clouds gather, seething with black tentacles that awaited but his command to fall upon his enemies. In his study far below, Kerrington could still hear his prisoner crying. "Why are you doing this to us?" Because I'm tired of being the one who is scared, impoverished, hunted. Because it's their turn now. Because I can. Because I'm a monster. Because there are no other choices any more. Kerrington extended a hand to the sky. Lightning crackled. A tentacle thick as the neck of a dragon dipped to him, and Kerrington mounted it like a tame horse. He rode the storm sweeping away from his tower, to the scene of his next atrocity. No one else saw them coming. It was a hot, sticky day in midsummer. The village green could be more accurately called the village yellow, grass sickly from the heat. Even Abrams' goats looked wilted, listless as they grazed in the shade of the big oak. The old men were sitting beneath the canopy of the store porch, fanning themselves and drinking beer from Martin's cold cellar. I was fetching water from the well, with Gabriel's firefox kit, Spark, gamboling at my feet. Spark was the only living thing that didn't mind the heat. The old men watch everything that happens in Granville, always alert for any new gossip. They noticed the cool breeze blowing in from the east and welcomed it, leaning back and closing their eyes to savor it. Spark lifted her head, ears pricked, and yapped at the wind. I sighed and splashed water from the well bucket on the back of my neck to cool off. The whisper-thin membranes of the wings I don't have spread to catch the cooling air. It was that, and not Spark's yips, that made me look east. I can feel my wings, flicking and shifting like a dragonfly's at my back, even though I know they're not real. But I can't usually feel things with my nonexistent wings. What I saw made my breath catch in my throat. I knocked the bucket back into well, took a step back, screamed, turned, fled. A storm of tentacles boiled behind me. They chased the dust of the road before them, sent the air churning ahead of hundreds of thick black sucker-laden ropes that quested through the village, snaked through open windows to invade the small houses, along paths, under and over the goats. Searching. I could not see where they began, whether they belonged to a hundred creatures or just one. The eye traveled back but there was nothing to trace them to, just more tentacles all the way to the horizon. No one else saw them. Martin turned to Old Bill on the porch as I hollered, "Dark One! Dark One!" What else could it be? We'd all heard the stories, of towns torn apart and looted by the Dark One's monstrosities. Until now, his presence had not been felt in our province -- but I knew in my bones this could be nothing else. "What's gotten into that fool boy now?" Martin said, and then yelped as a tentacle snagged on one of the canopy posts and pulled it down on top of the men. They cursed and struggled out of the canvas as the tentacle roared past them. Even then, they did not see it. It did not touch them. It was not looking for them. I saw because I kept looking over my shoulder in my headlong flight. I needed to know if they were still coming my way. They were, faster than I could run. I veered between houses, wove into Georgia's apple grove, trying to lose them between the trees. Spark fled with me, crying and baying at my feet. I don't know if she saw them too, or if she'd just been infected by my panic. Whichever the case, they were still closing, snapping like whips at my heels. I heard the roar of the river and knew I was nearing the cliff that runs at the back of the orchard. But they were right behind me. I leapt off the cliff. Maybe the wings I don't have will catch me, I hoped wildly. But the tentacles did instead.